The latest addition to my website is Haruki Murakami‘s 騎士団長殺し (Killing Commendatore). This is the usual Murakami, with a lone hero (a portrait painter by profession), trying to solve a mystery (or, in this case, several, possibly interrelated, mysteries), having to cope with the supernatural and helped by a strange but resilient girl (and, in this case, it it really is a girl, not a woman). The plot is complicated with pre-war Vienna, Mozart’s Don Giovanni, the art of portrait painting, paternity issues and secret hideaways galore all coming into the mix. 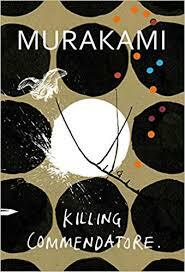 As always, with Murakami, the plot is complicated but it is all great fun and a really good read and while not of the quality of some of his earlier work, it is still a fine book.